Pretty good news for privacy-oriented people! BitTorrent unwraps its new instant messaging program that doesn’t store your metadata and helps you with encrypted communication to keep your online conversations private, whether its voice or text communications. BitTorrent named its Online chat service as "Bleep", a decentralised peer-to-peer voice and text communications platform that offers end-to-end encryption, therefore is completely safe from the prying eyes. In order to spread users’ voice and text conversations, Bleep make use of the BitTorrent distributed network rather than a centralised server. 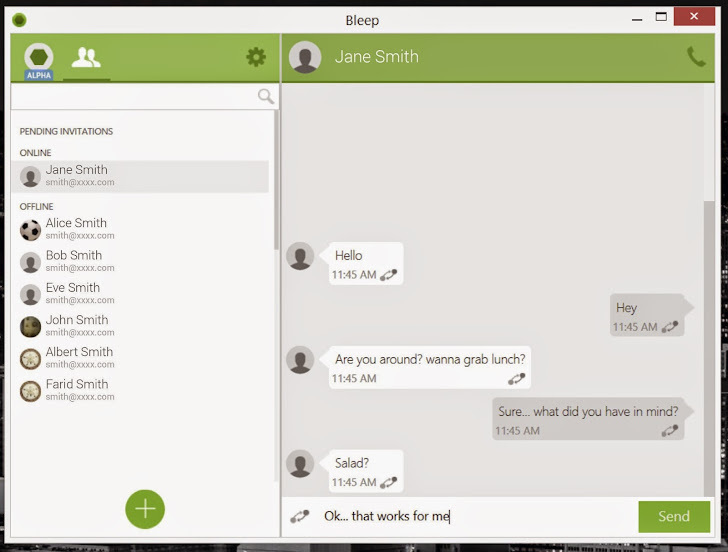 Unlike Skype or Google Hangouts, Bleep comes with with a completely decentralized design, giving you extremely strong anonymity. "We never see your messages or metadata," said Jaehee Lee, the senior product manager for Bleep, in a blog post announcing the new app on Wednesday. "As far as we're concerned, anything you say is 'bleep' to us." Bleep chat application promises security and privacy of your conversations that go through different nodes of encrypting instant message traffic by using the same decentralized approach which is behind torrents. For now, the company has released Bleep invite-only pre-alpha for Windows 7 and Windows 8 users, so you can sign up now. The new peer-to-peer communication platform, which was built on a fully distributed Session Initiation Protocol (SIP) server engine. The User Interface, a chat-and-voice-enhanced application that will be continuously updated over time to provide a great messaging experience. "BitTorrent does not track or store information on who is communicating with whom, or when communications happen," Fade said in a post. "We are not even storing data temporarily on servers and then deleting it. We never have the meta data in the first place. Person A finds Person B through other nodes in the network. We never track or store who is looking for whom." Till now, there is no possible security or privacy weaknesses listed by the company, but if attackers could succeeded in spoofing nodes of the BitTorrent traffic, they would intercept or redirect communications. BitTorrent chat app uses secure encryption protocols such as curve25519, ed25519 , salsa20, poly1305, and others for end to end encryption of whole communications, which according to him, "should be the new normal in the post-Snowden era". It is very simple to use. You can sign up now with an email address, phone number, or even as unlisted so that you don't have to provide any personal identifiable information. After that you can invite your friends and can also import your Google address book. Instant messaging apps that offers end-to-end encryption have surfaced fast in the wake of NSA revelations made by global surveillance whistleblower Edward Snowden. One such promising service is Invisible.IM chat service, an anonymous Instant Messenger (IM) that leaves no trace as it is supposed to use the Tor anonymizing network to distribute chatter wrapped in OTR encryption. Also Tor Browser Bundle is currently working on a new Privacy tool called 'Tor Instant Messaging Bundle' (TIMB), that will help you with encrypted communication to keep your online conversations private.